A glorious morning up in Gisborne and the girls all played well and in fact dominated the game in most respects but lost 1-3. It was one of those funny games where we had pretty much all the attack with the ball being in our attacking half most of the game. However, we could just not break through their packed defence and Gisborne managed to score their 3 goals from the 4 or 5 counter-attacks they mounted for the game. Part of the issue may have been playing on a full sized pitch - or close to it - our girls just could not quite connect in attack today and a lot of final shots or passes kind just weren't strong enough. An excellent debut today from Sarah our newest recruit. As with all the games this year is was a great game to watch and was another example of the progress you are all making as the season progresses. Two first time goal scorers - congratulations to Lam Nhi and Chloe - and I think its the first time we have had a header into the goals well done April - just a pity it wasn't into our goal - but its wonderful to see you using all the parts of your body. The goal by Lam Nhi was just perfect with passing from Annabel and Ishi making the space we needed and it was finished off with a great kick into goal. Chloe showed us that being in the right spot at the right time makes it possible to score goals - so well done Chloe!! Ishi had lots of great touches today and showed skills in both attack and defence that were also making it hard for the opposition to go forward. All round it was great to everyone playing as a team and passing the ball to eachother and running into position so that you can make positive plays. You should all be proud of yourselves. Enjoy the school holidays. South Yarra had to forfeit with school holidays - our girls remain on top of the ladder!! The game began with both teams unable to control possession and a lot of high balls bouncing over both sets of players. As it settled both teams were able to string some passes together. Kensington had a lot of the play in their attacking half but were not given any space to shoot by the Knights defenders. Highlight of the first half was a 1-2 pass pulled off by Olivia and Steph in the middle of the park to set up another attacking opportunity. On one of the rare occasions Melbourne Knights entered our defensive 18 yard box they managed to knock in a lucky goal from a tight angle so we were unlucky to go into the halftime break down a goal instead of up a goal. The second half was another tight affair; Charlotte continued her outstanding physical effort and was able to win the ball in midfield and bring it forward to put pressure on their defence; Abbey was rock solid in our defence as she covered the width of the field to cut out through balls and attackers running with the ball. The girls worked really hard and enjoyed another close game but couldn't quite create any clear cut chances to score a goal, but even so, it was an entertaining spectacle. We celebrated our first win for the season this week. Every girl played an important role in the win and there were many close shots on goal, but it was a captain's goal from Tara which put Kensington in front. These girls are always smiling but it was so nice to see their smiles of victory at the end of the game. Hopefully we can carry this positivity and confidence with us for the remainder of the season. Thanks must also go to Omar, Joe and Kelly for their valuable support and advice. 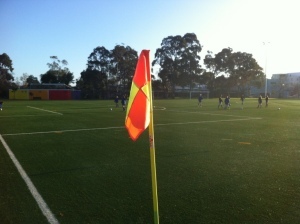 A brilliant result for the team yesterday with a long overdue decisive 4-1 away win at Darebin Falcons. Congratulations to Simone for her four goals and to the team as a whole for applying themselves to play bravely and skilfully. At half-time the score was 0-0. Kensington had a slight edge over Darebin having created more chances up front and looked very confident in defence. 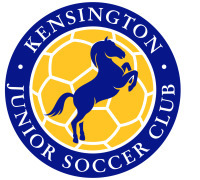 Within a minute of the 2nd half kick off, Kensington won possession quickly and Simone had the ball in the net before the crowd had time to settle! This set the trend for the half as Kensington became more confident and passed the ball around with a growing desire to score. With the support of the team's ongoing pressure play, any Darebin resistance fell away and Simone went on to score three more goals to cap of a fine team performance. Yesterday's winning team was: Bridget, Dereni, Emma, Juliet, Lisa, Maddie, Olivia, Rachael, Saskia, Simone, Tarn, & Zoe. Well done girls! This week there is no training and no game next Sunday 7 July. Enjoy the break and see all players at training on Tuesday 9 July at 6pm.